In 2005 New Earth Superfoods proudly introduced the very first version of Super Probiotic Coconut Yogurt to the world. This first version was a mix of kefir grains and yogurt cultures. We then offered various versions of Coconut yogurts sweetened and unsweetened as well as coconut Kefirs that where uniquely tailored for a variety of purposes. Both versions of Yogurt as well as Kefirs are powerful holistic additions to anyone’s diet. These Probiotics are l oved by adults and kids alike. As most Kefirs are typically cultured with dairy Kefir grains we did take a different route. We grew our grains in young coconuts and experimented what probiotics did well in this climate until we had the best formula! As an option to re-balance our Microbiome we created our Coconut Yogurt. It truly is delicious and can be consumed daily to help re-balance the gastrointestinal bacteria in your body. To receive the optimal benefits of our yogurt we recommend to consume within one week of opening. Our yogurt can also be used topically as a skin treatment for acne and to improve complexion, as well as to help treat candida in the body. 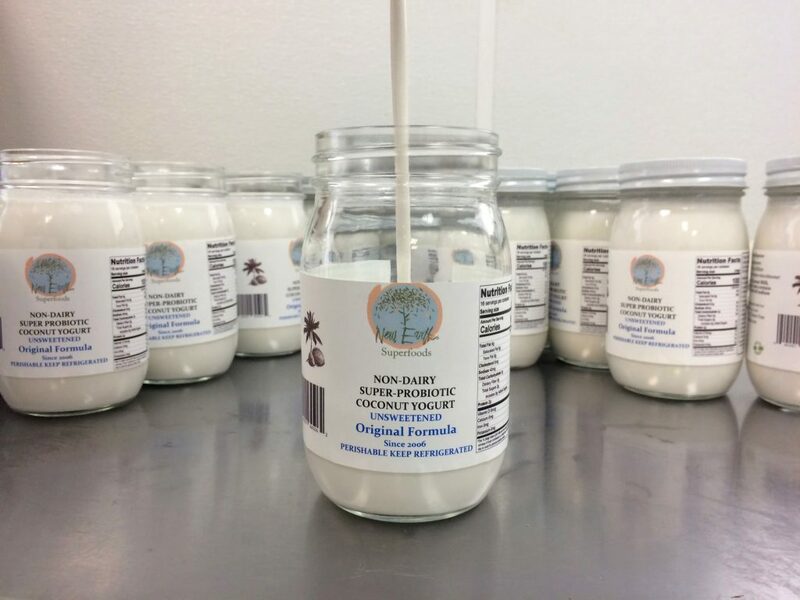 Both our Coconut Yogurt as well as our Coconut Kefir are made in small, handmade batches in our commercial facility in California. Active ingredients for our Kefir are Coconut water and Kefir grains. Our Coconut Yogurt contains Coconut milk and Spring water with a large amount of 15 strains of some of the most important Probiotics for gut health. It comes in Organic and casein free Vegan version and a pesticide free grown version that may contain traces of casein and maltodextrin from yucca. Our sweetened version contains small amounts of Coconut nectar as well. We also carry a super delicious unsweetened organic raw chocolate version. What are the ingredients in our yogurts? Bifidobacterium Coagulans GBI-30 6086 – It produces lactic acid in the intestines as well as an antibacterial substance called “coagulin”. Helps improve the immune system to resist virus related respiratory tract infections of cold and flu. Ganeden BC 30 – Produces lactic acid which lowers the pH of the intestines making it less hospitable for bad bacteria to grow. The only Bacillus with FDA GRAS (Generally Recognized As Safe) status.